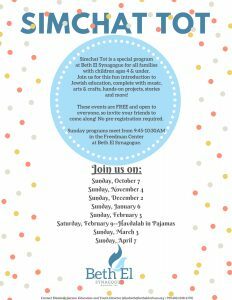 Beth El has a range of programs available for toddlers and their families. For more information regarding early childhood programs, contact Elisabeth Gerson at elisabeth@betheldurham.org. During Simchat Tot, which takes place one Sunday morning per month, families with children age 4 and under are invited to join us for songs, stories, and craft projects. Simchat Tot is a relaxed, fun gathering. Each one explores a new Jewish theme. We get going at 9:45 am and finish at 10:30 am, in the upper level of the Freedman Center, across the parking lot from the main sanctuary building. For more information, contact Education and Youth Director Elisabeth Albert Gerson. The Annual Simchat Tot Havdallah in Pajamas is an (adorable) highlight of the year. We eat snacks, sing songs, read stories, and enjoy celebrating the end of Shabbat together. 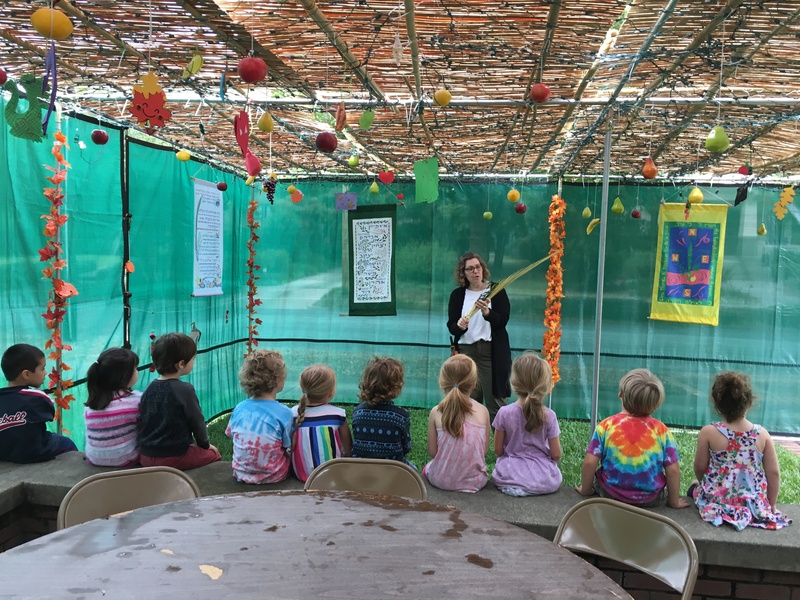 We also regularly have Tot Shabbat services on Saturday mornings at 10:30 am, geared for kids age 4 and under, plus their parents. 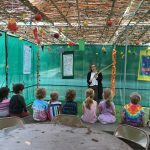 For more on Tot Shabbat, check out our children’s services page. 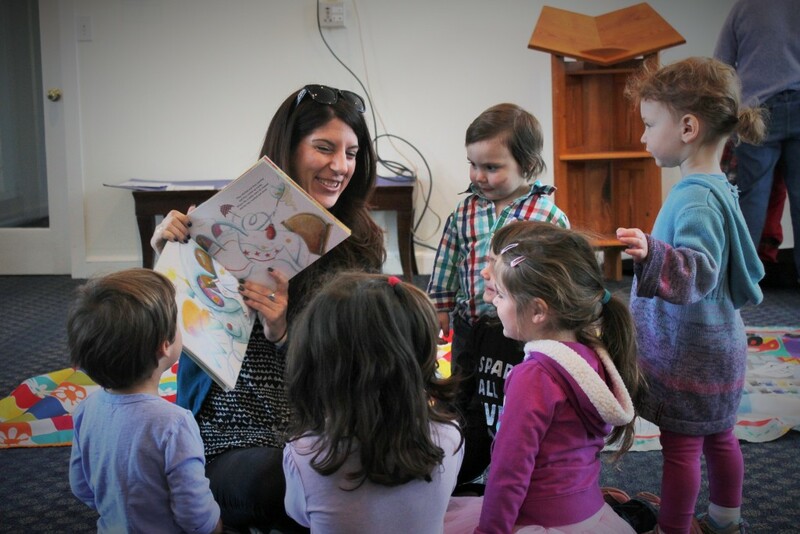 Beth El Preschool is a child-centered warm and wonderful Jewish preschool. 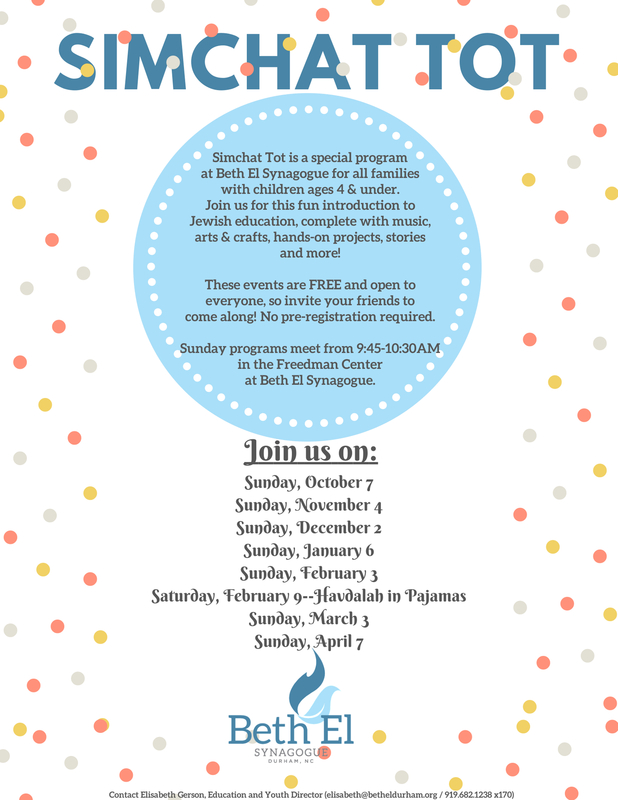 Located in the main building, Beth El Preschool is open to the community at large – not just Beth El members. The Preschool features low teacher-student ratios, small classes and loving and experienced educators. You can find more information about the preschool here. In addition to the monthly books children receive, organizations also coordinate various family programs under the branding of PJ Library. The Jewish Federation of Durham-Chapel Hill, in partnership with Beth El Synagogue, Judea Reform Congregation, Kehillah Synagogue, and the Lerner Jewish Community Day School, is excited to bring this special gift to your home!